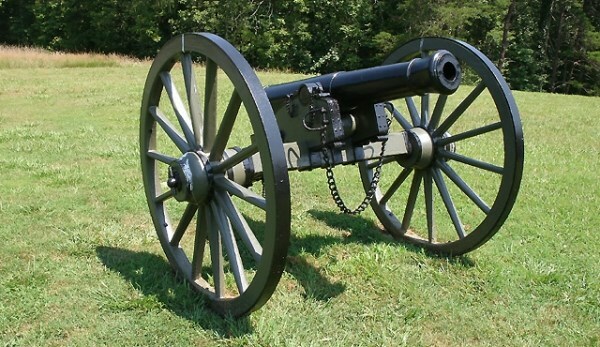 A family-friendly mystery cache hidden in historic Carnifex Ferry Battlefield State Park south of Summersville, West Virginia. To get the value of A: Go to the "Battle of Carnifex Ferry" informational sign that's just to the right of Patterson House. Read the sign. Subtract 22 from the number of Federal soldiers killed in the battle. To get the value of B: Walk northwest across the field to the right of Patterson House to the grave of Granville Blevins. Read the "Journey's End" informational sign. What is the number of the month in which Granville Blevins, his brother and friends joined the Confederate Army? To get the value of C: From the grave, walk east across the field toward the road and go to the cannon. Read the "Artillery Thunder" informational sign. Subtract 4 from the number of artillery pieces that it is believed that each army had. To get the value of D: From the cannon, walk south across the field back to the Patterson House parking. Then go east, directly across the road and down through the mown field, to the Patterson Trail sign. Read the "Friendly Fire" informational sign that's just to the left. How many soldiers were killed in the friendly fire incident? Now that you have the coordinates to the final location, proceed on out Patterson Trail beyond the "Friendly Fire" sign until you come to the hiding place. The cache is a 1.2 qt. Lock & Lock container with an orange West Virginia State Parks "Official Geocache" sticker. Initial contents are: 2 cosmetics samples, 2 glass "gems", golf ball, pencil sharpener, toy horse, yo-yo, jingle bell, spiky elephant, 3 foreign coins, earphone, fancy bead, flat magnet, and a log book with pen. Carnifex CannonReplica Cannon at Carnifex Ferry Battlefield State Park.